I was never particularly fond of «World of Warcraft», but have greatly enjoyed the other games set in the «Warcraft» universe. For instance, once when I was a young but poor student, I survived through a whole Easter vacation with nothing but water, bread baked from edible stuff I found in a cupboard and «Warcraft II» as my only sustenance. 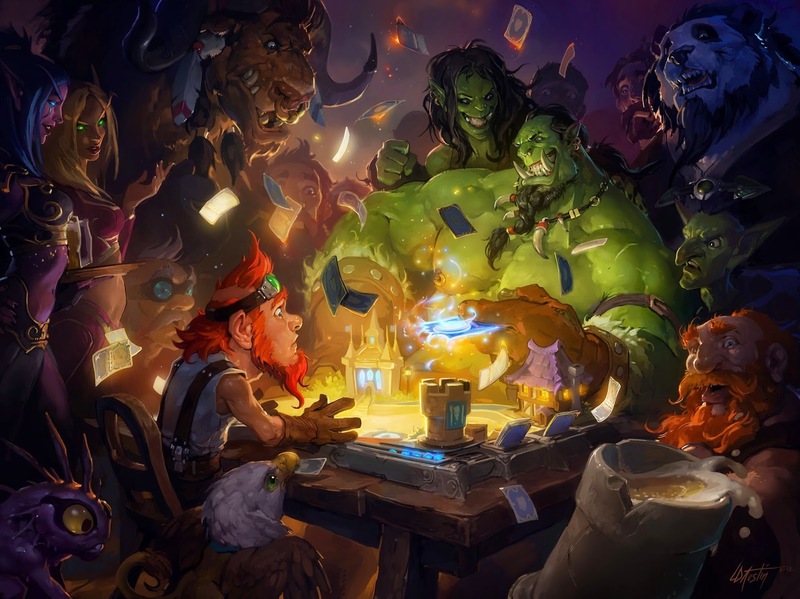 The newest branch on the «Warcraft» family tree is «Hearthstone», a digital collectible card-game which has been out for Mac and PC for a while now and just had its worldwide iPad release. Unlike most attempts at translating card-games into a digital format - which sometimes work, but usually just makes you yearn to play with real cards - «Hearthstone» was designed for the screen from the get-go. One of the primary advantages of digital card-games is that they can be played online, and the Internet is usually filled with people who are more than willing to play a game or two, no matter what time of day it is. This in stark contrast to my circle of friends, where the opportunities to get together and play anything has gotten fewer and fewer as we all have aged into somewhat responsible adults. 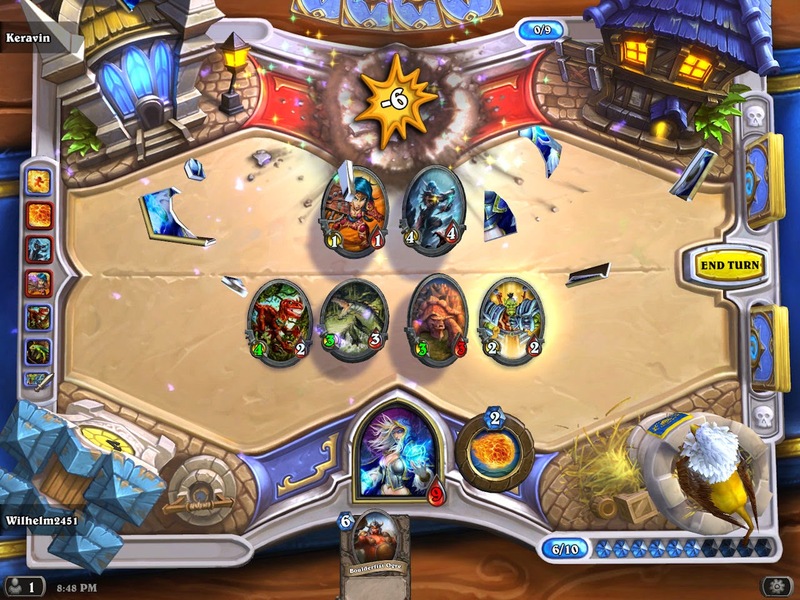 «Hearthstone» is however a true pleasure to play online. Never before have I experienced a gamer community this civil and sportsmanlike. I like to think this is because you play the female mage «Jaina Proudmore» through the game's mandatory tutorial, thus making the most obnoxious homophobic misogynists who are often drawn to competitive games lose interest already at this point, since they have no muscular hero to identify with. Realistically, it probably has more to do with the fact that the game offers no chat functionality, and that the only way to communicate with other players is by using a predefined set of polite emotes. Another advantage computerized card games have over their paper based predecessors, are animations and sound effects. As is par for a Blizzard game, both the colorful graphics and the tavern inspired soundtrack hold high standards. Particularly the sound effects are worth mentioning, as many of the one-liners made by cards when put into play are hilarious, even after hearing them several times. The genre leader: «Magic: The Gathering» is for instance a game of such high levels of alternating effect-response interaction between players, that it's often difficult to tell whose turn it is unless you can communicate face to face. As a result, the digital variants of the game are limited in either depth or usability. «Hearthstone» completely bypasses this problem by eliminating the possibility of playing cards during your opponents turn. It's also gotten rid of other complicating factors like unique phases to a round, and cards with different play speeds. As such, the game might seem lacking in depth when looked at from the eyes of a seasoned «Magic: The Gathering»-veteran, but from a game design perspective, these decisions are actually quite clever. Even though the flow of the game is simplified, tactical depth is still present, but is now primarily bound to the order in which you choose to take your actions and the relative placement of cards in relation to each other. 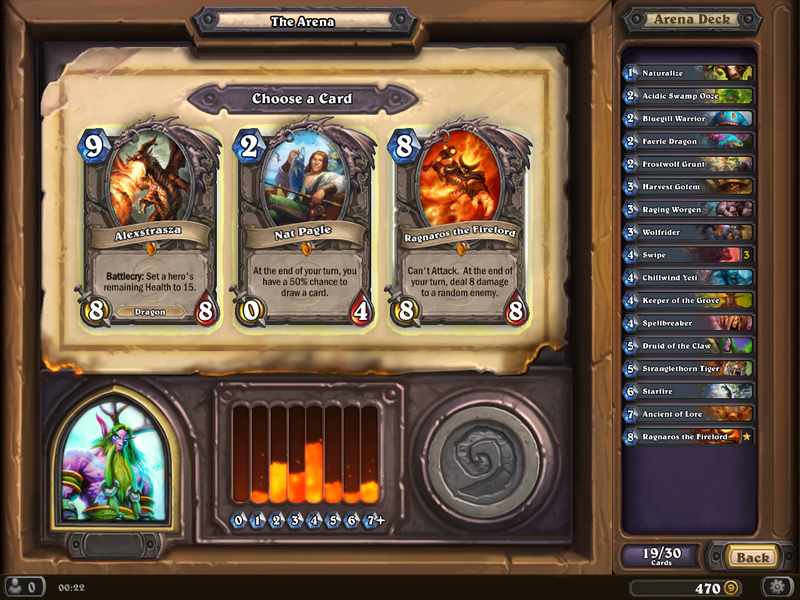 «Hearthstone» is as a result an intuitive and easy game to learn, with a GUI which just works. It even to some extent incorporates the psychological aspect of "playing" your opponent. When your adversary points at something on their side of the table, it moves slightly or lights up, thus giving you an indication of the thought process involved. It's therefore feasible to read, and by extension also to bluff your opponent. Rounds are often short, and the tempo is high with little idling while the game is on. If anyone uses too much time on their turn a fuse starts burning in the middle of the table, which motivates the hesitant player to make his move. A game is usually over in 10-15 minutes. «Hearthstone» is free-to-play, a payment model which usually isn't free at all, and has a tendency to ruin games which otherwise could have been quite decent. 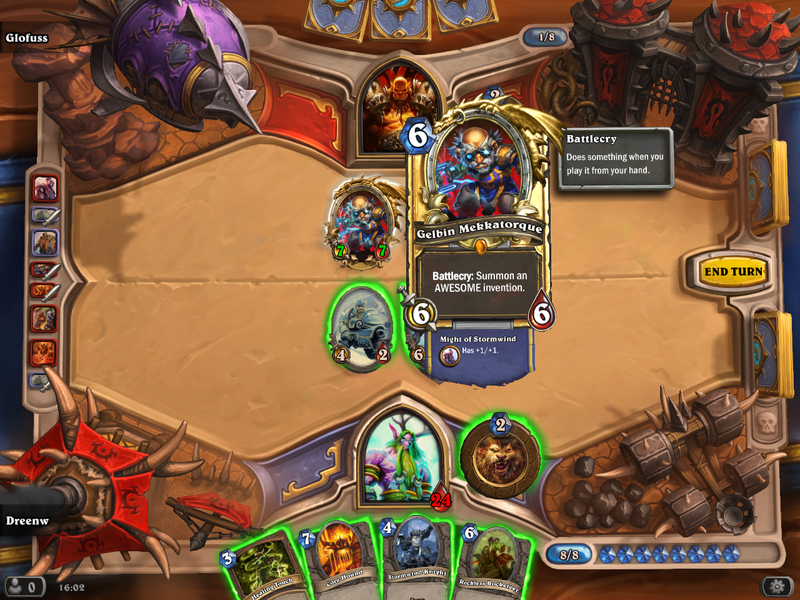 It is however implemented tastefully in «Hearthstone». First of all, there is no in game spam urging you to buy stuff. But most importantly, the game is balanced so that you actually don't need to spend money to enjoy it. You can of course spend cash on packs of random cards in order to supplement your card-base, but it's not really necessary unless you are impatient. It's completely feasible to build your collection steadily just by participating in arena tournaments where card packs are awarded as prizes even if you strike out completely and loose all your battles. Tournaments are played in a «draft»-format where you construct your deck by choosing 30 out of 90 cards from a random card pool. This pool usually contains cards which you don't own yet, and tournaments are therefore also an excellent opportunity to experiment with new card interactions. Access to the arena is however gated by a cost of either in-game gold or real currency. Gold is accumulated by just playing the game well, so it's quite possible to finance your arena participation by just winning a lot. Blizzard has however geared the prize ladder carefully so that many people likely will be tempted to spend some real money sooner or later. But ultimately, «Hearthstone» classifies as one of the few games where I can't really find anything seriously negative to put my finger on. It's fun, easy to get into and can realistically only get deeper and thus better, as it gets expanded with new content. I therefore declare it the current number one threat to getting anything else done.